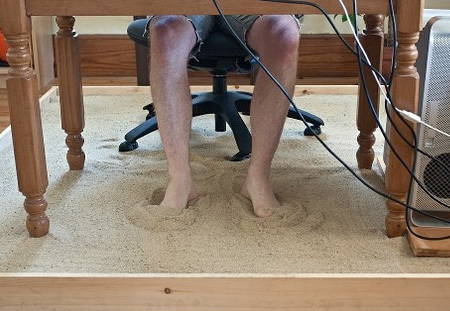 American artist Justin Kemp placed large sandbox underneath his desk and transformed his office into a relaxing beach. Now he can work from home and feel like he is on permanent vacation. The sand itself will soon get dirty and will be all over the apartment. The presence of a cat, dog or a child will seriously aggravate the picture. wonderfully. For practice. Optional: 1. Heated from the bottom. 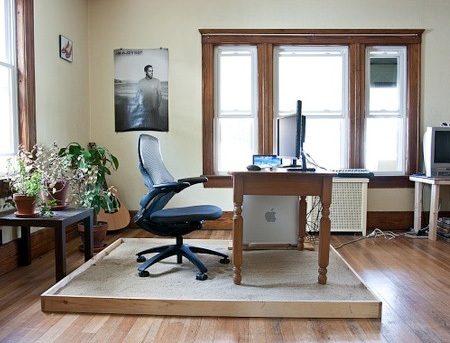 2. small and medium-sized pebbles 3 wide fenders with a brush grass – that would not drag sand around the room. perhaps with 4 colander vacuum cleaner foot. 5. Device for washing washing drying sand regularly. 5.1 can be at the bottom of the funnel device constant circulation cleaning of sand. Ignited, smoke through the filter clean sand constantly pour add under the table. 1. warm stones of the pavement ? 2. sawdust ? 3 buckwheat husk? 4 pillow under foot. Rock salt. Everything is cheap . Silver fraction for a list of Forex 5. pool with warm sea water depth of 20 cm . sand fraction in the bottom water massage. . I thought this was great for about 2 seconds. Then I realized that he’ll have to get out of the sandbox and walk around his apartment. 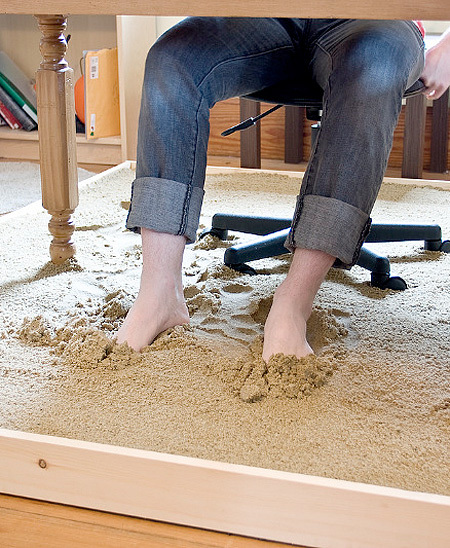 Solution: Fill the entire apartment with sand. 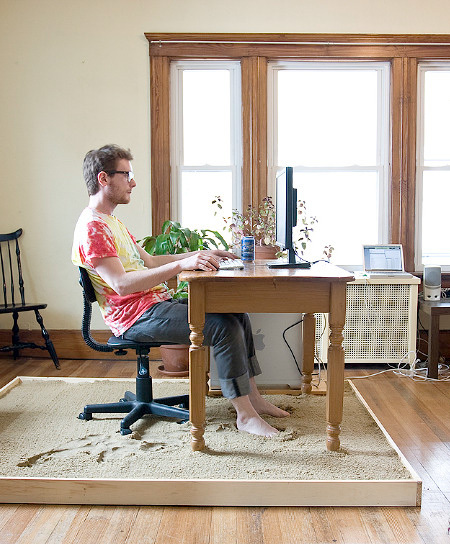 PS: He is using a mac,.. but no apple screens..
and, where are the speakers and little table on picture 2, That sand is dangerous! BAAAAAD IDEA! Nice to think about however, not to DO. 2) No kitty, NO not in MY sand box! 4) That’s damp sand…so how does it stay damp and what happens to the nice wooden box when it’s damp all the time!? Have you ever heard washed sand? Your feet would no more get dirty. Would be nice and relaxing for about two minutes, until you try to move the chair and it won’t budge. how the table stands that good? I’m thinking of putting some sands in my shoe while in the office. There is no need for so much sand. Make a little box which you could fit your feet in, fill it with sand and that should suffice. You should also keep another plastic box filled with water to wash your feet when you want to move away. Won’t work if you have cats in the house!